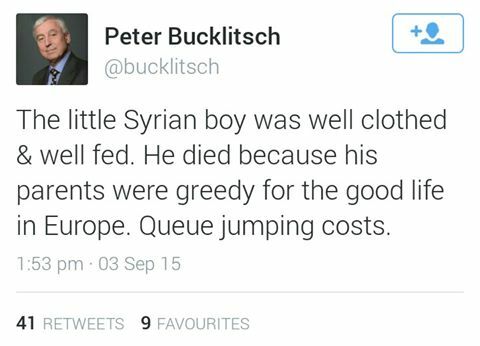 Peter Bucklitsch, failed UKIP parlimentary candidate for Wimbledon and former Lib Dem and Tory (what? ), prompted outrage on social media this afternoon after claiming that the infamous photo of drowned Syrian toddler Aylan Kurdi was owing to his parents’ greed. 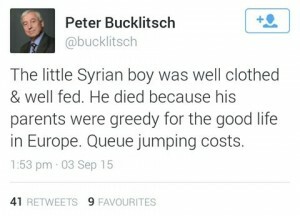 According to Bucklitsch, the child looked “well clothed and fed”, and that he needlessly died, along with his mother and brother, as they wanted to pursue a better life in Europe. 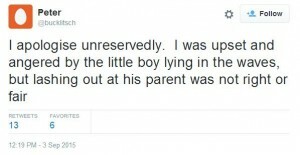 The rationale for the comment seems to be that the family were staying in the relatively safe and prosperous Turkish City of Bodrum, having escaped from Syria, and had risked their lives to travel to the Greek Island of Kos by Dinghy, with the intention of settling with relatives in Canada. However, the vast majority of the population have decried the comment, notably Stan Collymore, whilst rallying behind the pro-asylum movement. Most people recognise that the current immigration surge is owing to “push factors”, notably the Middle East being a bit of a mess, rather than “pull factors”, such as risking your life for a bit of that sweet sweet European welfare. Bucklitsch has since apologised, saying that he was “upset and angered”, and has removed his twitter profile picture and deleted the tweet. 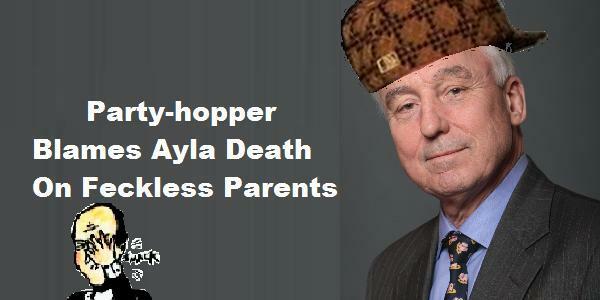 UKIP have distanced themselves from #Bucketlistgate, saying that Peter is not a representative and his views do not correlate to party policy.